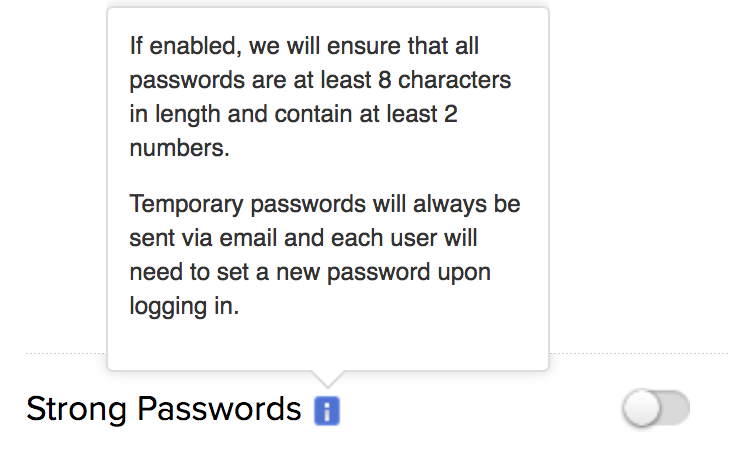 Within Teamwork Projects, passwords should be at least 8 characters in length and contain at least two numbers, as standard. You can enable the option to force all users to use high-security alphanumeric passwords, in your site settings. This ensures that every password is at least 8 characters in length and contacts upper-case and lower-case characters and at least one number. To edit this option, click your profile icon in the top right corner of your site, and select Settings from the dropdown menu. In the Settings area, go to the General tab, where you will see an option for Strong Passwords. Toggle the switch to enable/disable the setting.